Generate booth traffic for a small company at a large trade show. Small companies often have exciting products, but small marketing budgets. No where is this felt more than at a large industry trade show, where traffic is largely dependant on booth size and location. The client asked the creative team (M7 and Wardog Creative) to execute a standard trade show promotion with an invitation and booth giveaways (i.e., key chains, coffee mugs, t-shirts, etc.). Wardog Creative suggested a better, more cost-effective approach based upon the company’s product advantage: superior sound quality. 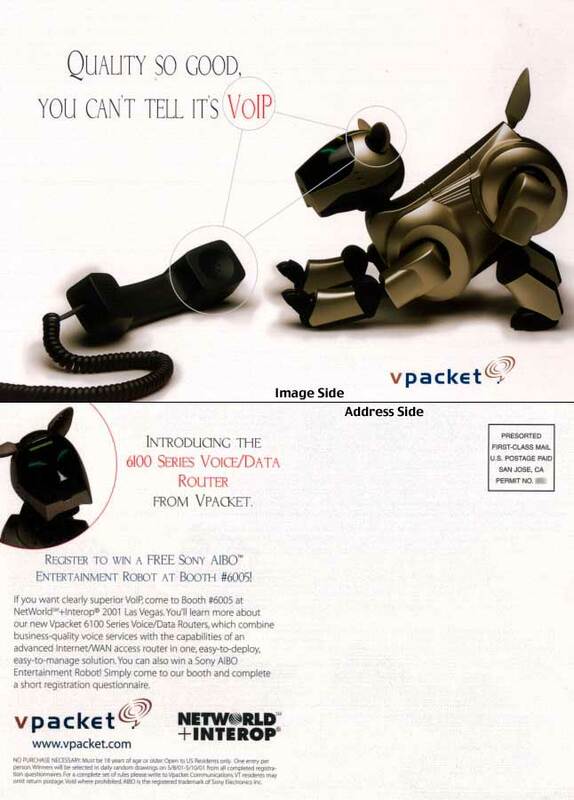 Instead of giving away $1500 worth of trinkets, we photographed a Sony AIBO robotic dog mimicking the famous “His Master’s Voice” painting. The robot was featured at the booth to attract traffic and was raffled off on the last day. The promotion was so successful, the company repeated it in its entirety for several more trade shows.